Chinese tariffs on American pork, a massive cow cull in New Zealand and a three-week trucking strike in Brazil may seem to have little relevance to beef cattle producers in Australia. JBS commercial manager northern Brendan Tatt speaking at the 2018 RNA Paddock to Palate weight gain competition awards lunch at the Jondaryan Woolshed yesterday. But each are examples of seemingly unrelated factors that can indirectly buffet or boost Australian beef sales in an intrinsically interconnected global meat market. Addressing the RNA Paddock to Palate competition field day at Jondaryan, Qld, yesterday, JBS commercial manager northern Brendan Tatt offered several ‘big picture’ examples of how global developments, such as the unfolding trade war between the US and China, can affect Australian beef exports. While yet to take effect, China is now threatening to increase tariffs on US pork to over 60 percent, in retaliation for US president Donald Trump’s recent decision to impose 25 percent tariffs on $50 billion of Chinese goods. Such a massive tariff hike would render US pork unviable in one of its largest export markets, and follows similar tariff hikes imposed on US pork by another major market, Mexico, also a retaliatory response to President Trump’s trade war. “If that US pork can’t go to China it will go somewhere else,” Mr Tatt explained. “That pork might end up in Korea and Japan, and if it is very cheap and there is heaps of it, they will just buy more of that and eat less beef. “So whilst these things don’t impact us directly, everything is connected. A nationwide strike by truck drivers over fuel prices and wages recently shut down Brazil’s economy for three weeks. Meat couldn’t be transported or shipped to export customers, and Australian beef picked up orders as a result. But the benefit for Australia was likely to be short-lived, as Brazil now sought to move a resulting stockpile of meat in its cold stores onto export markets at discounted prices. New Zealand’s Government recently committed to spending almost $1 billion to cull more than 100,000 cows over the next year or so in a bid to eradicate Mycoplasma bovis from the nation’s cattle herd. Most of the beef, which the NZ Ministries of Health and Primary Industries say is safe to eat, is likely to be exported, pushing an unanticipated additonal supply of grinding beef toward key export markets in coming months. Positive developments on the export horizon included Australia’s pending negotiations with the EU and United Kingdom to form new trade agreements with each, post-Brexit. 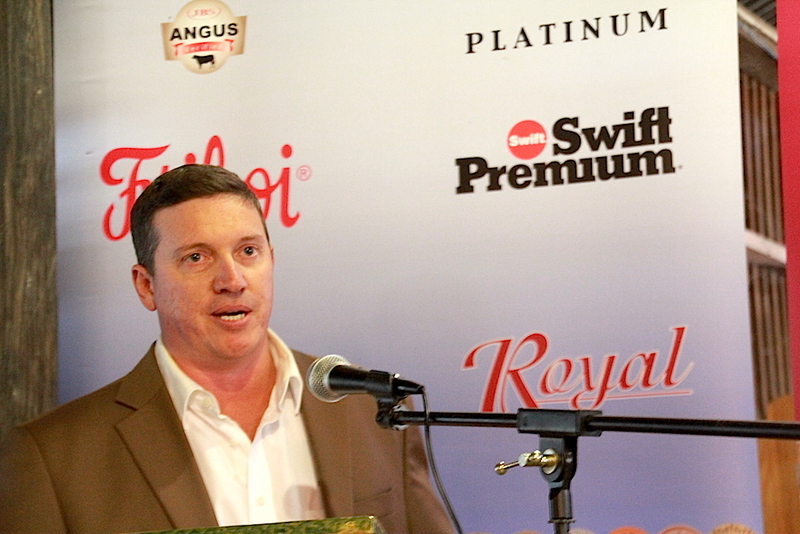 Mr Tatt said the UK in particular offered exciting potential as a future market for Australian beef. “Potentially the UK one is very big for us,” he said. “If you go back to the 1960s and early 1970s, the UK took enormous amounts of Australian production. “Once the EU was formed and quotas came out it just fell like a stone. Recent improvements in the US economy and employment meant there were now another 10 million people in the US workforce earning a wage, driving further spending and consumption. For the first time, American meat consumption is expected to surpass 100kg of meat per person this year, an “enormous number”. Not only is the US consuming record amounts of meat, it is also producing record amounts of meat. However, in similar circumstances to Australia, expanding drought and dearer feed prices are curbing production levels. Mr Tatt said the challenge for Australia’s beef industry is to continue to give consumers a reason to buy Australian beef when there were so many other options available. To do this Australia needed to be “very very good” at production, presentation and price, he said. While Australian beef sells at a premium relative to most of its competitors, there was a limit to how large this premium could be, he said. “If you make it too big, it is bit like Land Cruisers, make them $120,000 for a ute and you will all buy something else. “You will pay for quality, and so will our customers, but it has to be comparable to everything else. “It was great for farmers when cattle prices got to $6/kg dressed. We couldn’t sell that meat sustainably long term and we lost a lot of customers. “Vice versa cattle were too cheap when we were paying $1.50/kg for feeders, that wasn’t sustainable for our industry either. When I started exporting beef to the UK in 1960 practically all Australian meat and dairy products went to this market – GAQ Ox bone-in sides and quarters. A few offals and, of course, lamb carcasses. Admittedly we enjoyed Commonwealth preference – no import duties. Our main competitor for this trade, particlaly lamb, was New Zealand. Both the UK and the EU should be a good outlet for Australian beef if our politicians can forge a good trade agreement and if we are competitive. The numbers of cattle likely to be culled for M. bovis are tiny when compared with NZ’s annual slaughter statistics and many to be culled would have been slaughtered anyway, making the relevance at all to prices Australian beef producers receive highly questionable. It’s also interesting to see the article quoting the New Zealand Ministry as saying meat from M. bovis is safe to eat, rather than citing it as a fact – M. bovis has been present in Australian feedlots for decades, as it is in every other beef producing country, and clearly poses no food safety risk. Mr Tatt is right….$6.00/kg cwt is unsustainable…..unsustainably low! Mr Tatt this is the absolute minimum cattle producers need to survive unless JBS would like to chip in for our fodder bills we are now paying every week to keep the cows, now calving..alive. We need at least $8.00 to be viable long term.